what color do you see it as? black & blue or gold & white. bc i see it as gold & white but then when i save the picture & then open it on my laptop it turns black & blue? 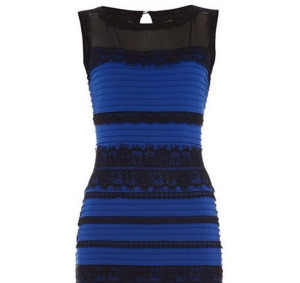 I see it has black and blue. 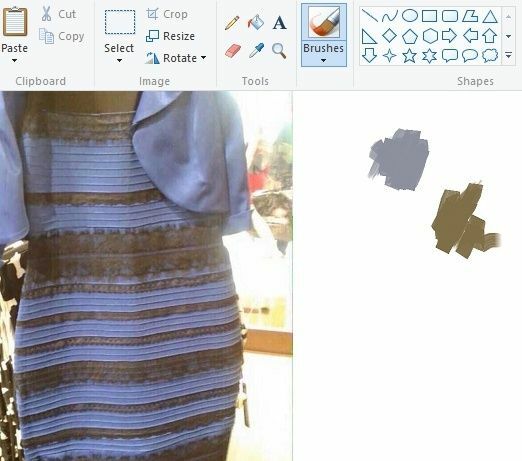 If it is supposed to be gold and white then idk what happened. ^^ i see it as black & blue now. idfk tbh. those r the colors i see. if this proves anything then cool. Edit: Now that I see the photo on instagram again, it looks blue and black. I can't unsee it now._. Edit again: If I flip my computer screen down a bit then back up, I can see it as white and gold again. But if I blink it turns to the other colors. Fourth edit: I SAW WHITE AND GOLD BUT THEN I WENT ON HERE AND SAW BLUE AND BLACK AND THEN I SAW WHITE AND GOLD AND I AM CRYING AND I DON'T KNOW WHY I AM SHAKING AND I REALLY NEED TO CALM DOWN AND NOW I SEE IT AS BLUE AND BLACK. AND NOW THE OPPOSITE COLORS. 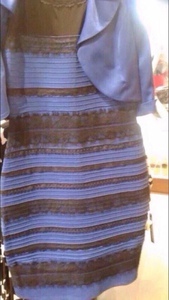 I must be colorblind, I have seen this dress a million times but I have not seen why people think it's black and blue. ^^ i realize that now bc my parents say that it's blue & black. Its blue and gold ! Idk !!!! Actually, now that I look at it.